The truest friendships are the ones that stand the test of time and endure through the good days and the bad. People who love their pets know the bonds that exist between ourselves and our animal companions are especially strong. So it’s not surprising when we find that sometimes those who are united by their love of animals form strong friendships, too. Someone who understands that dynamic very well is Terry Seaks, economics professor emeritus from the University of North Carolina at Greensboro, and longtime friend of the NC State College of Veterinary Medicine. 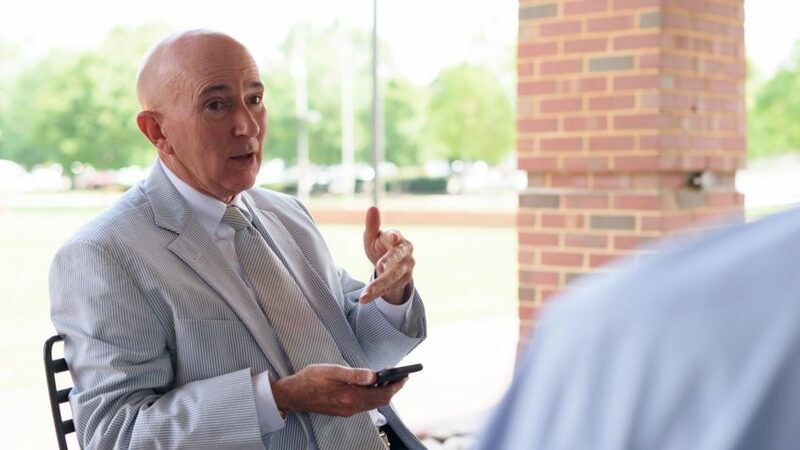 During a recent visit to the CVM campus he spent a spring afternoon in conversation about his long-standing connection with the College. “I’ve seen a long history of miracles here,” he says. That history begins in 1994 with a cat named Fluffy. Terry and Jane, his late wife, had both grown up with dogs, but once they were married and on their own, the Seaks became cat people. By and by, Fluffy developed what at first seemed to be some sort of skin allergy, with a great deal of itching and loss of hair around the ears. A variety of treatments failed to help, and when the Seaks discovered spatters of blood on the wall from Fluffy’s scratching, they knew something more needed to be done. The case was referred to NC State. Finding an effective treatment continued to be elusive until, after some serious deliberation, DVM Barbara Atlee formerly of the Dermatology Service suggested chlorpheniramine maleate, an antihistamine in a number of over-the-counter human allergy pills. The human dosage was too much for a smaller animal like a cat, so just a portion of the tablet was needed. “It was like a miracle cure,” Terry says. From then on, Fluffy was given a small piece of the human-sized pills every day, and the seemingly incurable allergy symptoms disappeared. Fluffy had a partner in crime — a white cat named, appropriately enough, Snowball. Snowball, too, was destined to be the star of an even more dramatic narrative. When healthy, Snowball tipped the scales at a robust 13 pounds, but seemingly out of nowhere, the normally frisky 8-year-old feline began to lose weight, eventually dropping to 9 pounds. That’s a nearly 31 percent loss of body weight. Initially, the problem was thought to be the result of a kidney ailment, and there was discussion of taking a biopsy. “Fortunately,” Terry says, “Adam Birkenheuer got involved.” Birkenheuer is a professor of internal medicine at NC State, and he strongly advised against what would have been a risky procedure. Indeed, further evaluation by CVM clinicians found that the source of the problem was Snowball’s heart, and that was the cause of the resulting kidney function and weight loss problems. 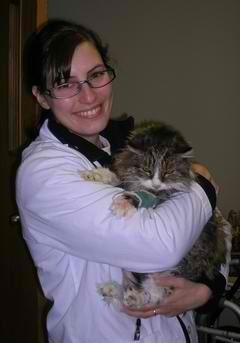 Snowball was almost in heart failure. Clarke Atkins, a professor of medicine and cardiology, identified an unusual taurine deficiency, and by administering digitalis and prescribing a dietary supplement, Snowball returned to full health and lived eight more years to age 16. Coincidentally, both Atkins and Birkenheuer happened to come by where Seaks is being interviewed, and they chat pleasantly. Terry has lots of friends here. Resuming his narrative , Terry recalls that in 2002, when Fluffy was 13 years old, she suddenly stopped eating. 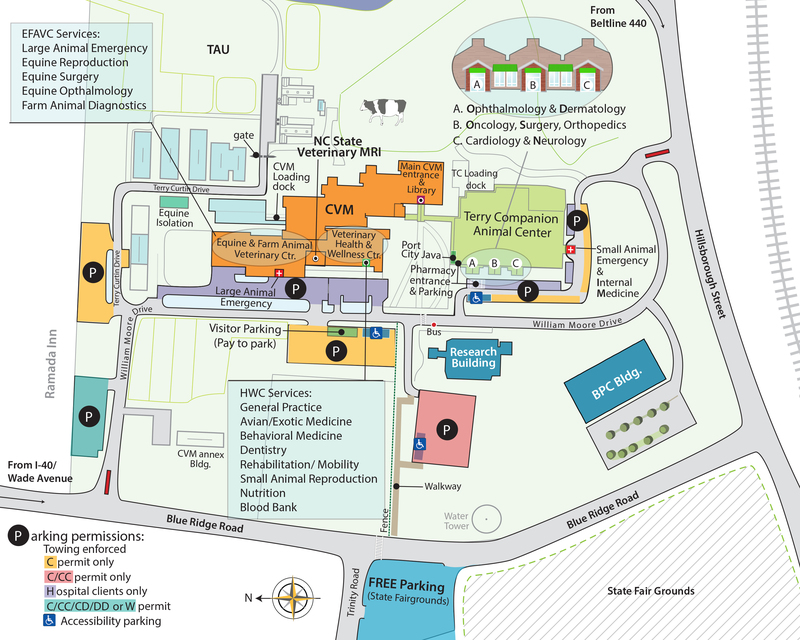 Another referral to NC State resulted in the discovery of a cancerous tumor in the left lung, which was successfully removed by Lizette Hardie, professor of general surgery and now department head of clinical sciences. In gratitude, the Seaks created two endowed scholarships to provide assistance to students at the CVM to help assure the continuation of the medical excellence they had witnessed at the College. It was to demonstrate results sooner than they anticipated. “Fluffy recovered completely and thrived for six years until a second, separate tumor appeared in her right lung,” Terry says. “Fluffy apparently had a genetic tendency to this rare feline lung cancer. Saving Fluffy’s life the first time was remarkable enough, but CVM surgeon Kyle Mathews performed a second miracle, removing a cancerous right-side lung lobe.” And amazingly, Lauren Pugliese, a fourth-year student and a recipient of the Fluffy Seaks endowed scholarship, assisted with Fluffy’s care this time. “What goes around comes around,” Terry adds. Since then, Terry has been a fast friend of the CVM. He and his wife not only created the two endowed scholarships, they sponsored three “Coats of Excellence” to honor Atkins, Hardie and Matthews, and Terry went on to long and distinguished service on the board of directors of the North Carolina Veterinary Foundation. He even comforts friends who have lost beloved pets by sponsoring bricks in their honor as part of the campus’s Walk of Honor. But that’s not all. While a member of the board, Terry happened to hear then-dean of the College, now provost the the University, Warwick Arden, report that there were no endowed professorships on the faculty of the CVM. Terry was incredulous that could be the case, given the College’s consistently high ranking among the top veterinary colleges in the nation. Terry decided that to honor his wife Jane, who was suffering from advanced Parkinson’s disease, and to support the school that had meant so much to both of them, he and Jane would sponsor the College’s first endowed chair, the Jane Lewis Seaks Distinguished Professorship for Companion Animal Medicine, established in 2007. The first recipient of the professorship was announced in 2009, and it was cardiologist and professor Clarke Atkins, who first handled Fluffy’s case. Since Atkins’ retirement, the professorship has been awarded to Bruce Keene, now the Jane Lewis Seaks Distinguished Professor of Companion Animal Medicine. Beyond that, while still a member of the board, Terry worked with fellow board member Susan Ward and others to provide the newly-opened Randall B. Terry, Jr. Companion Animal Veterinary Medical Center on the CVM campus with a wonderful art collection. Included in the collection is a beautiful painting of the Seaks’ own Fluffy and Snowball. The two cats will always hold a special place in Terry’s heart, even though he has gone on to own a total of eight cats — five of whom currently populate his household. In fact, during the afternoon’s conversation, Terry couldn’t resist sharing one last story about Fluffy and Snowball. A special kiosk bearing assorted historical information about the College that is displayed on campus includes a photo of Fluffy and Snowball along with some background about the scholarships named after them. Searching out the kiosk’s current location, Terry points to the photo of Fluffy and urges a guest to take a closer look at the smudge where the details of Fluffy’s nose should be. Sure enough, the pigment has been worn away. With a smile, Terry reports that one the students who had received the scholarship named for Fluffy had made a habit of finding the kiosk and rubbing Fluffy’s nose for good luck before taking his exams. Apparently the luck rubbed off, because he is now a CVM graduate. Then again, that’s not surprising, since lots of good things have rubbed off on the College of Veterinary Medicine thanks to Terry and Jane Seaks.